Jeju’s beautiful bike pathsFour Jeju paths have been chosen as part of ‘100 Most Beautiful Bike Paths in Korea’ list. The paths on the ‘100 Most Beautiful Bike Paths’ list were selected by the Ministry of Government Administration and Home Affairs to help revitalize the areas near to the trails and to encourage bike riding during autumn. The 100 paths consist of ‘Couple Paths’ for families and couples, ‘Tourism Paths’ for riders looking for food and attractions, ‘Health Paths’ for people seeking relaxation and ‘Mountain Paths’ for advanced riders. 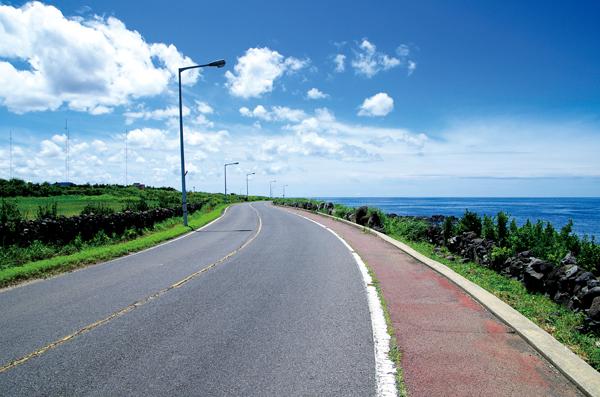 The paths chosen from Jeju are all coastal trails that take in some of Jeju’s most beautiful seaside scenery. The trails include 25km from Jongdal Seashore to Gimnyeong Seonsegi Beach, 10.7 km from Aewol Coastal Road to Aewol Handam Park, 8.8km past Hamo Beach, Mt.Songaksan and Mt.Sanbangsan and 10.7 km past Bird Island, Cheonjiyeon Falls, Jeongbang Falls and Soesokkak Estuary. The ‘100 Most Beautiful Bike Paths in Korea’ booklet will be available in community centers, travel agencies, tourist information centers and also through online platforms such as the Ministry of Government Administration and Home Affairs homepages and social media sites. As well as producing the booklet, the ‘Most Beautiful Bike Paths in Korea’ campaign will hold events like travel journal and photo contests. The Jeju government will also help promote the scheme through the placement of the bike path booklets and promotions in the websites.